February is Jewish Disability Awareness, Acceptance, and Inclusion month! 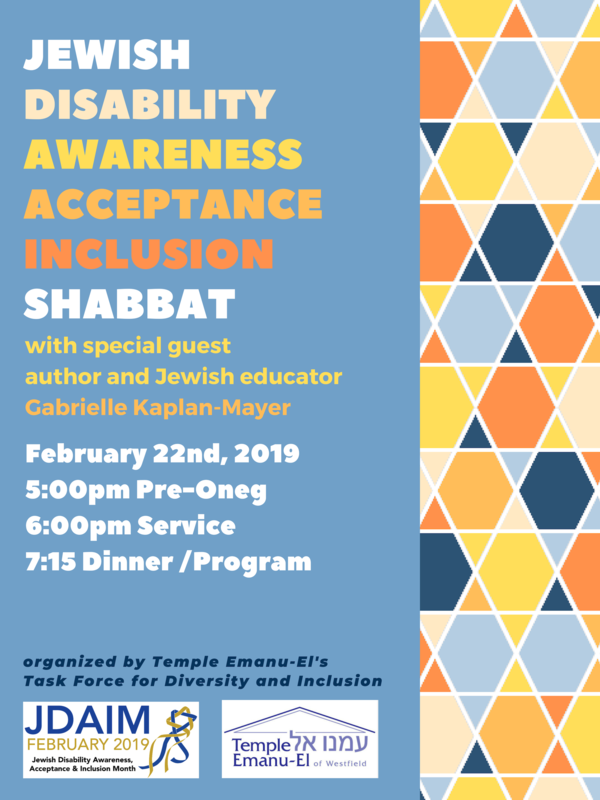 Help us celebrate the diversity of our community and together, create an inclusive Shabbat experience for all. We are proud to welcome our guest speaker: author and Jewish educator Gabrielle Kaplan-Mayer. Following services, join us for dinner and special program that Gabby will facilitate. Advance sign-up for dinner is required – please RSVP by Tuesday, Feb. 19th. If the cost of the dinner is an issue, please speak with our Executive Director, Brian Chartock, at 908-232-6770 x 114. All payments must be received in advance of the dinner. Thank you to our Task Force for Diversity and Inclusion and to our team of staff and volunteers for organizing this meaningful Shabbat experience. A big thank you to Temple Emanu-El’s Religious School Fund for helping to underwrite costs associated with this evening. As I am recovering from a bad fall (3 fractured ribs, 9 stiches over my eye brow and extensive bruising) I plan to attend the pre-oneg and the service, but don’t have the stamina to stay for dinner. Sorry to have missed so many of the meetings, all of them beyond my control, but hopefully I’ll do better in the weeks to come, and I’m looking forward to seeing everyone tomorrow evening. 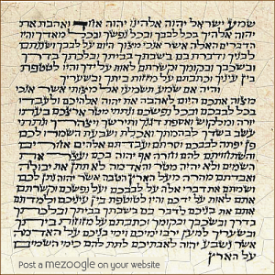 Hi Jane – We hope you feel better soon and look forward to seeing you at the JDAIM service this Shabbat!